Papell with Love: Pretty Pink Posh June - Watercolor Blog Hop! Hello...hello, welcome to the Pretty Pink Posh Watercolor June Blog Hop! Remember the Blog Hop is officially open tomorrow June 5th 6 am PST. where everyone can post their creations and it ends on June 8th. To begin my first project I watercolored the watercolor paper panel using my watercolor palette I created using paint tubes from Windsor Newton to create my background. Once its dried I adhered the Wplus9 new Party Animal stamp set images that I watercolroed and die-cut the images using the Coordinating dies. I also added some Stickles on the balloon to give it sparkle. The new Wplus9 products will be available on June 5th. Next, I adhered a strip of the new Pretty Pink Posh Stitched Borders 3 dies (scalloped) on the side of the card and added some of the new iridescent sequins in Lavender Moon, Bermuda Blue, and Sparkling Clear to finish off the card. For my second card I also watercolored the background using my watercolor palette. Once its dried I die-cut the bottom of the watercolored panel using the Pretty Pink Posh Stitched Border 2 dies (large scallop) and adhered the Pretty Pink Posh Picket Fence die. Next, I stamped the sentiment "you've got happy mail" from the new Wplus9 Happy Mail stamp set. Next I added the banner, envelope & bird on top of the panel, also from the Happy Mail. Next I adhere the die-cut watercolored bunny, butterfly, flower, squirrel, and bear also from the same set Happy Mail, which will be available on June 5th. To finish off the card I adhered some Pretty Pink Posh Sparkling Clear sequins :). 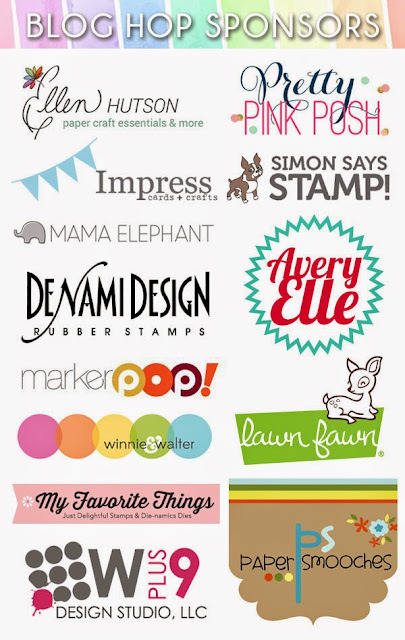 Pretty Pink Posh also have these Amazing Sponsors that you don't want to miss. For more Inspirations please visit Pretty Pink Posh Blog. Have an Amazing Day Hopping! oooooo! luvin' the color combos!! Your cards are adorable and the water color technique really enhances the images. Thanks for sharing!! I'm so in love with that giraffe! You did such beautiful watercoloring on your projects! Joni, these are the most adorable cards! I love these stamps and how you used them! Fantastic water colouring! So cute. Love watercolor, sequins and Wplus9 stamps. Perfect. These are both just so amazing, I really love that adorable giraffe! These are both so pretty and the images are adorable!! LOVE the banner on the second card! TFS! Love love love these cards!! I love how soft and sweet those critters are!!! Love the subtle backgrounds you created!! This is stunning Joni! I love the sweet scene you created, so adorable! Such cute cards! Absolutely adorable - both of them! Lovely cards, love the softness of your coloring and the scenes you created, especially the balloon string around the giraffe, how sweet! Your cards are so cute! I love the stamps as well as your creative use of the dies and great water coloring. Love the storybook feel to your cards. I adore every bits of your both cards. And those new release from Wplus9, you just brighten my day! LOVE both your cards, the subtle watercolor backgrounds are beautiful and the sequins are a stunning detail! Such sweet cards! Lovely watercoloring Joni! Adorable cards, love the subtle watercolor backgrounds, and those sequins add a stunning detail. Love both these cards and so badly want that giraffe set. Tomorrow can't get here fast enough for me to order it when it releases. Wonderful cards. Your watercoloring is beautiful. I love those critters! Your cards are adorable. Such beautiful subtle colors. Very sweet cards...love the watercoloured backgrounds. Both your cards are just so sweet. Beautiful cards! I love watercolour! These little critters are so adorable, and your warm, soft watercolors make them even more so! The Stickles on the balloon is a great finishing touch. Darling cards! I love those sweet little animals. Adorable cards! Love the watercolor backgrounds! I must find time to play around with mine more! Your cards are amazing, I love your color combos and design! Beautiful as always!!! Love them all!!! These cards are both gorgeous! I love the soft palette of both of them! Both cards so sweet!! Just like pages in children's story book!! Beautiful cards! They have such dreamy feel! Amazing cards Joni. Love the sweet images you used... fantastic scenes and coloring. I love the soft, storybook characteristic on your cards. Thanks for inspiring us. Oh my, these cards are just fantastic! The coloring, the design....I love them! Gorgeous cards!!!! So sweet and so very pretty!!!! These cards are just amazing! Oh these cards are so super cute love them both but that water colour background is awesome I really wanna have a try! Absolutely adorable...works of art, both! Sweet cards !! Your backgrounds are beautiful and the scenes are adorable! Beautiful cards! I love the soft subtle color! Very pretty! Oh my gosh, so, so cute!!! Both cards are darling!!! Look like storybook images! Wonderful job on the backgrounds of these delightful cards. Your cards are absolutely amazing! I love them!!! Your cards are so sweet and very pretty! Really cuate cards! Love the sequins!!! Oh how cute--love all these little critter cards! You have AMAZING water color skills. I'm jealous! Very sweet cards! I really like the color of your background on your first card! These are absolutely gorgeous! Love your watercoloring. Wonderful job on both cards, I loved them. I want all of these new stamps and dies just do not have the money to get them all, but they are going on my wish list and I will get them as I can. SO SO pretty!! Love the giraffe and the animals card. Love the softness of the watercolors. These are just gorgeous Joni! Amazed as always! These are such cute cards. Lots of inspiration for my next watercolor project! I love all the detail on this card. The little bird on the banner is so precious! Absolutely adorable cards! I love the cute critters and the soft coloring you achieved. I always enjoy your watercolor projects Joni!! These are awesome!! Your cards are just adorable. Beautiful cards! Your watercoloring is fantastic! These are gorgeous and full of cuteness ! I'm liking those watercolor backgrounds! These are both DARLING!!! Love your use of watercolor - absolute perfection! Love the soft colours, your work is to die for! so cute. These cards are adorable. Both your cards are absolutely gorgeous! I love the soft watercoloring you have done. That giraffe is so adorable!! Adorable cards! Love in this blog hop… Thanks so much for the chance to win! God bless! Oh wow!!!! Your creations are sooooo beautiful! You are a watercolor diva! Breathtaking! I can tell this isn't your first watercolor project - Just gorgeous, the both of them. Oh my goodness... Both of your cards are so stinkin' cute and adorable!!! Oh my your cards are stunning!! The mixture of water color and adorable animals is spectacular! Two gorgeous cards. I love the soft background on the second one. I love how delicate your cards looks with your choice of colors and the watercoloring technique! So gorgeous! Thanks for sharing! Both of the cards are really cute! Love the giraffe! These cards could be used for any occasion! Those are adorable! I love the soft colors. ADORABLE! Love the new WPlus9 release! These are SUPER ADORABLE ! These are absolutely adorable, thanks for sharing your creativity. So pretty! I especially love your first card. Amazing cards. so cute. Thanks for sharing. Love your creativity. Love the cute cards and the water coloring is perfect. Wow! These cards are so pretty. They should be in a frame. I set my alarm for the WPlus9 release to make sure I got these 2 sets. Really love them. I love these soft, sweet cards! Such adorable scenes and lovely watercolors! Thank you so much for sharing! Beautiful cards! Love the soft colors & the watercolor technique. Thanks for sharing! Squeeeeeaalll! These are so stinkin' adorable! The pairing of the soft watercolor washes with those too-cute-to-handle critters is genius! What sweet cards! 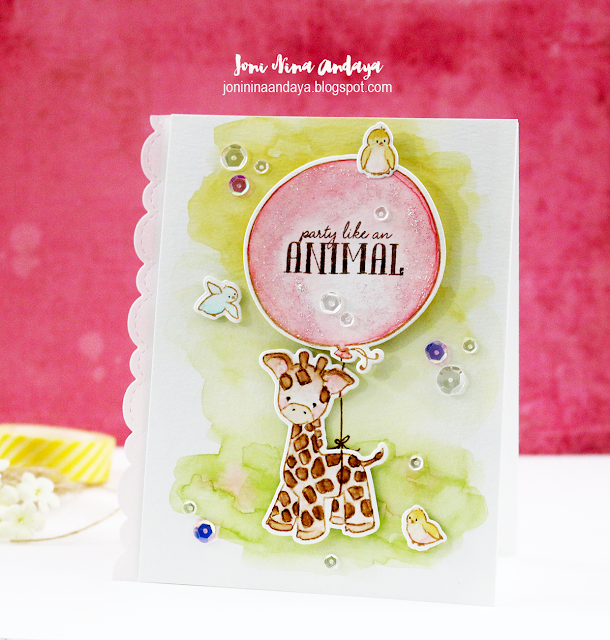 Love the soft watercolor backgrounds and animals! Adorable! Love both cards! The animals are adorable! Fantastic watercoloring! Both cards are adorable! Thank you for sharing your talent! oh my goodness! these just couldn't be any cuter and so beautifully watercoloured! Those little animals are SO adorable! Great job with the watercoloring! Really sweet cards. I love the watercolor effects. Precious images. Loved both cards. Thanks. Your cards are adorable and I love the soft watercolor backgrounds! Super cute cards, Joni. Love the muted watercolor backgrounds and the sequins are a perfect finish. Thanks for sharing. The cuteness factor on these two cards is off the charts and your watercoloring is so soft and pretty. Wonderful cards! Sweet cards!! Love the glitter balloon!! Aww! What an adorable AND pretty card! Now youve done it! I want that adorable Giraffe Set! Great Job! Such cute cards! your coloring is absolutely beautiful! I just love that giraffe card! So pretty! These two card are just the cutest! Love the little critters, and the coloring is fabulous! They're both sweet, but I just LOVE that cute giraffe and those fab colors! Adorable! Love all the cute critters! These cards are adorable. So creative and cute. Love them. These are absolutely adorable. Love the baby giraffe and the colors you used. These cards are so beautiful. They are mini works of art and look like illustrations from a children's book. Amazing! Adorable little scenes you created with these cute critters. I like the sequins too. Your cards are both adorable and you did a super nice job watercoloring them. The added touch of the sequins justs makes them pop. So sweet!! Love he soft colors!! These are both so soft and pretty...perfect for children's cards! I love the overall use of neutral colors with hints of yellows, pinks, blues -- truly awesome work. Your backgrounds are so beautiful! These are adorable little images!!! These are both adorable...I'm pretty new to the watercolor for cards but can tell these stamp sets are a must! Such pretty cards! Love the little animals, especially the giraffe! 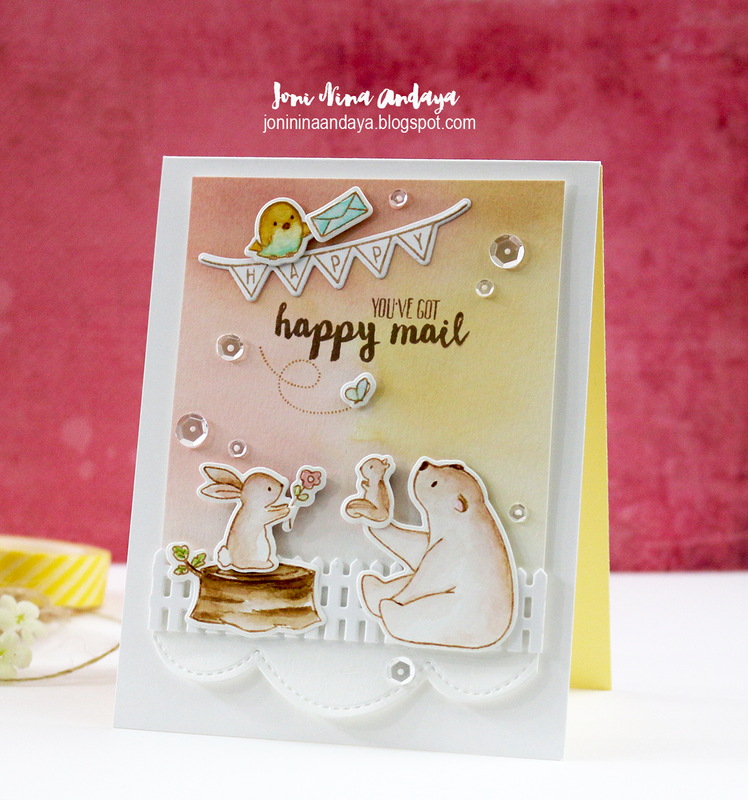 I love your cards with the new stamps & dies with watercolouring. Those are such sweet soft cards! I swear, everything you create is just breathtaking. I am in awe of your talent and the beauty you create. Thank you so much for sharing your talent with us! OMG, that little giraffe is just too cute! Love your card! These are just so darling! I love them both equally!! These are so cute! I love the new stamp set, "You've got mail"! Both of your cards are absolutely beautiful!!! Love your colors! Such darling cards! Who could not smile looking at both of these cards? Too Cute! I'm going to check out these stamp sets which have now been released. Love your water coloring. Adorable cards! I don't make too many cards involving animals, but you've given me lots of reasons to start doing so. I love the PPP stitched border dies. Your cards are both fabulous! Love your amazing coloring and exquisite details. Yor cards are very cute. I love the soft colors. What beautiful cards! Love the watercolors! Absolutely beautiful cards. Your coloring and creativity are wonderful. Thanks. Your cards are adorable! Amazing colouring.